Helotes (/həˈloʊtɪs/ hə-LOH-tis) is a city in Bexar County, Texas, United States, located on the far northwest side of San Antonio. It is part of the San Antonio-New Braunfels Metropolitan Statistical Area. The population was 7,341 at the 2010 census. According to anthropologists,[according to whom?] the area was occupied seasonally from about 5,000 B.C. by small bands of nomadic Native American tribes in search of food and game. The Lipan Apache moved into the area in the late 17th century and occupied it throughout the 18th century. However, the Lipan were forced from the area in the early 1820s by the Comanche Indians. A small farming and ranching community began to develop in the area shortly after the Texas Revolution in the late 1830s. The ranches suffered occasional attacks by the Comanches until the late 1870s. In 1858, a Scottish immigrant, Dr. George Marnoch, purchased the land that would later become the site of the town. Marnoch's home at one time served as a stagecoach stop and a post office for cowboys driving their cattle from Bandera to auction in San Antonio. His heirs sold a portion of their property in 1880 to a Swiss immigrant, Arnold Gugger, who built a home and mercantile store around which the town of Helotes sprang to life. In 1908, Gugger sold his property to Bert Hileman, who opened the town's first dance hall. He was also instrumental in getting old Bandera Road paved and opening the town's first filling station. He sold his property in downtown Helotes in 1919, when the town's population declined. 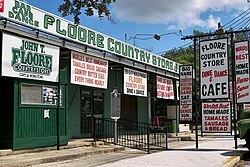 In 1946, the manager of San Antonio's Majestic Theatre, John T. Floore, opened the landmark John T. Floore Country Store, which is actually a dance hall (or honky tonk) that draws top country music talent including Willie Nelson who still plays the venue on occasion. Floore also financed the first annual Helotes Cornyval festival in the 1960s, which was held to celebrate the opening of a new post office. Corn played an important role in the heritage of Helotes. The local Native Americans planted corn, actually maize, in the fertile valleys of the area, and feed corn was a major crop grown in the 19th and early 20th centuries. The town name is derived from the Spanish word elote, which can mean "ear of maize", "corncob", or simply "corn", but exactly how the town came to be called Helotes is still a subject of debate. As the urban sprawl of San Antonio expanded and approached the outskirts of Helotes in the 1970s, residents determined to take their fate into their own hands. After a decade of planning and negotiation, Helotes became an incorporated city in October 1981. To this day, residents still struggle with the dilemma of maintaining the city's rugged country charm, while at the same time allowing for the development of modern suburban facilities and businesses. Helotes was the hometown of the late Texas state Senator Frank L. Madla, who died after his home on the south side of San Antonio caught fire on November 24, 2006. When Helotes incorporated in 1981, there was very little in the town. Now with a population of over 7,000, Helotes is becoming one of the most desirable suburbs of San Antonio. Helotes itself includes the newly renovated Old Town Helotes. Completed in 2011, Old Town Helotes is the revitalized downtown of Helotes, which includes John T. Floore's Country Store, All That Glitters, L&M Feed and Supply, Mander Automotive Service, First Baptist Church of Helotes, Elf Hardware, HelotesTactical Firearms, Helotes Creek Winery and El Chaparral Mexican Restaurant. Helotes is home to Oak Valley golf course, the first golf course in south Texas to be fully lit at night. The Morales family built the golf course on their vast acres of land acquired by Lorenzo Morales, a pillar of the community. He was extremely influential in settling Helotes. Other shopping centers off the major thoroughfare of Bandera Road include Walmart, CVS Pharmacy, Dollar General, Dairy Queen, Bill Miller BBQ, Sonic, Starbucks, BBVA Compass Bank, Broadway Bank, and the Helotes Post Office. At the intersection of Loop 1604 and Bandera Road is Tiller Automotive est. 1983, and the popular Bandera Trails Center and Bandera Centre Shopping Center. Both shopping centers provide a large variety of shops, eateries, and entertainment including Target, Kohl's, Barnes & Noble, HEB Grocery, Lowe's, Home Depot, Gold's Gym, Santikos Silverado 16 Movie Theater, T.J. Maxx, and many other stores and restaurants. The Cornyval Festival is an annual city tradition bringing in local vendors and thousands of area residents to celebrate the namesake of the town. Helotes is located in northwestern Bexar County in the valley of Helotes Creek where it exits from the Texas Hill Country. The city is approximately 16 miles (26 km) northwest of downtown San Antonio. Texas State Highway 16 runs through the community, leading northwest 30 miles (48 km) to Bandera. The Charles W. Anderson Loop, the outer beltway around San Antonio, is 2 miles (3 km) southeast of the center of Helotes. According to the United States Census Bureau, Helotes has a total area of 6.6 square miles (17.0 km2), of which 0.004 square miles (0.01 km2), or 0.06%, is water. As of the 2000 census, Helotes had a population of 4,285 residents. The population density was 1,014.3 people per square mile (392.0/km²). 1,525 housing units were registered with an average density of 361.0 per square mile (139.5/km²). The racial makeup of the city was 86.95% White, 26.49% Latino, 2.24% African American, 0.14% Pacific Islander, and 3.03% from two or more races. Additionally, Helotes had 1,471 households of which 40.2% had children under the age of 18, 79.9% were married couples living together, and 12.2% were non-families. 10.6% of all households were made up of individuals and 4.5% had someone living alone who was 65 years of age or older. The average household size was 2.91 persons and the average family size was 3.13 persons. With regards to age, the population consisted of 26.8% under the age of 18, 5.5% from 18 to 24, 29.3% from 25 to 44, 27.6% from 45 to 64, and 10.8% who were 65 years of age or older. The median age was 39 years. For every 100 females, there were 96.6 males. For every 100 females age 18 and over, there were 96.1 males. The median income for a household in the city was $76,951, and the median income for a family was $80,090. Males had a median income of $50,625 versus $38,362 for females. The per capita income for the city was $29,534. About 2.0% of families and 2.0% of the population were below the poverty line including 2.4% of those under the age of 18 years and 2.9% of the age of 65 years or older. ^ a b "Geographic Identifiers: 2010 Demographic Profile Data (G001): Helotes city, Texas". U.S. Census Bureau, American Factfinder. Retrieved April 11, 2014. ^ a b c d "Texas Historical Commission city marker (archive copy)". Texas Historical Commission. San Antonio, Texas: Palo Alto College. Archived from the original (JPG) on 27 February 2007. Retrieved 26 December 2006. ^ a b c d Michael R. Causey (Fall 1998). "Helotes Small Town Research Project (archive copy)". San Antonio, Texas: Palo Alto College. Archived from the original on 6 April 2007. Retrieved 26 December 2006. ^ a b "City of Helotes: Tourism". City of Helotes, Texas. Retrieved 26 December 2006. ^ "John T. Floore Country Store". John T. Floore Country Store. Archived from the original on 18 December 2006. Retrieved 26 December 2006. ^ a b "Backgrounder: Helotes Cornyval". Helotes Festival Association. Retrieved 26 December 2006. ^ "The Handbook of Texas Online: Helotes, TX". The Texas State Historical Association. Retrieved 26 December 2006. ^ "City of Helotes: General Information". City of Helotes, Texas. Retrieved 26 December 2006. ^ "Frank L. Madla". Answers.com. Retrieved 12 March 2007. ^ "Corporate Limits & ETJ Map." Helotes. Retrieved on July 12, 2018. ^ "2017-18 Elementary School Attendance Areas." Northside Independent School District. Retrieved on July 12, 2018. ^ "2017-18 Middle School Attendance Areas." Northside Independent School District. Retrieved on September 8, 2016. ^ a b "2017-18 High School Attendance Areas." Northside Independent School District. Retrieved on July 12, 2018. ^ Uresti, Carlos (2018-07-11). "Photos show $1.7M Helotes home of convicted felon and former State Sen. Carlos Uresti". San Antonio Express-News at the Houston Chronicle. Retrieved 2018-07-12. Wikimedia Commons has media related to Helotes, Texas. This page was last edited on 6 January 2019, at 01:34 (UTC).